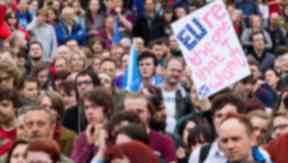 Protesters gathered as Nicola Sturgeon attended meetings with senior EU politicians. Thousands of pro-EU campaigners have demonstrated outside the Scottish Parliament to protest against Brexit. 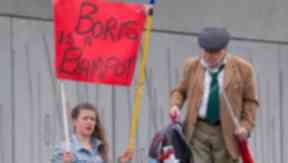 The crowds gathered outside Holyrood on Wednesday afternoon, waving banners with slogans such as "We believe in EU", "EU're the one that I want" and "Boris is a bampot". 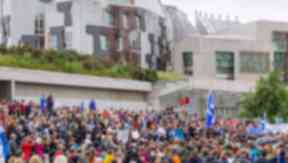 STV's Holyrood editor Colin Mackay estimated that between 1500 and 2000 people were taking part in the demo. A separate event took place on George Square in Glasgow at the same time. The protests came as First Minister Nicola Sturgeon insisted she has had a "sympathetic response" from EU leaders when she told them Scotland wants to stay in the EU, despite the UK voting for Brexit. The SNP leader said she had been "heartened" by the "willingness to listen" of the political leaders she met in Brussels. "I found doors to be open here today," she said. A total of 62% of Scots supported staying in Europe in last week's referendum, with Ms Sturgeon having said a second independence referendum is "highly likely" in the wake of the UK decision to leave. Ms Sturgeon said: "If there is a way for Scotland to stay, I am determined to try to find that way."